We’re doing a special recap of some of our favorite recipes that you can try for your Christmas feast! This will also be our last post of the year! So Merry Christmas and Happy New Year! See you in a couple weeks! Place onion in a pan and cook, stirring occasionally over a medium-high, for 5 minutes or until golden. Add the garlic and cook for 2 minutes or until aromatic. Add the wine and cook for 2 minutes or until reduced by half. Add the bell peppers, tomato paste, diced tomatoes, bay leaves, stock and thyme. In a separate pot, melt 4 tbs butter. Add in chestnuts and 1/4 c. wine. Bring to boil and let simmer for 15 minutes, until the chestnuts start getting a little soft. Stir in the shredded bread and olives. Cook for 1 hr 45min (or until goose is brown and meat thermometer reads 175F), flipping the goose over every 35 mins. You may baste the goose with white wine every 30 minutes as well. Heat oven to 325°F. If shallow roasting pan does not have rack, line with heavy-duty foil. 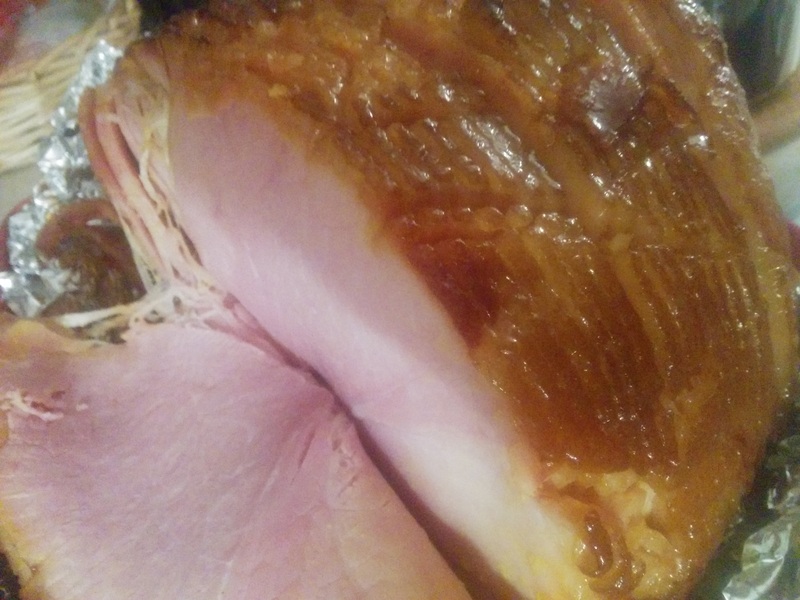 Place ham, fat side up, on rack in pan or in foil-lined pan. Score ham diagonally at 1-inch intervals, cutting 1/4 inch deep; score in opposite direction to form diamond shapes. Pour water into pan. Bake 1 hour. Meanwhile, in medium bowl, mix glaze ingredients. Pour half of mixture into 1-quart saucepan; set aside for sauce. Remove ham from oven. Insert meat thermometer so bulb reaches center of thickest part of ham, but does not rest in fat or on bone. Brush ham with some of glaze in bowl. Bake 2 hours or until thermometer reads 140°F, brushing frequently with pan drippings and remaining glaze in bowl. Let ham stand in pan 15 minutes, spooning pan drippings frequently over top. In a small saucepan, combine the cornstarch or arrowroot powder and water. Stir in the apricot jam, brown sugar, wine, and lemon juice. Cook over medium-low heat for 5 to 6 minutes until the sauce is thickened and bubbly. Stir in the blueberries and cook 2 to 3 minutes. Spoon the sauce over the ham and serve. SIFT the flour, ginger, cinnamon, cloves, baking powder and salt together in a medium bowl. Set aside. PLACE the butter and sugar in the bowl of a stand mixer fitted with the paddle attachment. Beat on medium speed until the mixture is light and fluffy. SWITCH the mixer to low speed and gradually add the egg, molasses and vanilla extract. Increase the speed to medium and beat until smooth. SWITCH the mixer to low speed and add the dry ingredients in 3 additions, pulsing the mixer to incorporate each addition before adding the next one. TURN the dough out onto a lightly floured work surface. Knead a few times to incorporate any crumbs. DIVIDE the dough in half. Roll each half into a log about 1½ inches in diameter and 12 inches long. As you roll, gently push the ends toward the center to prevent air pockets and to keep the logs at an even thickness. WRAP the logs in plastic wrap and refrigerate until firm, at least 3 hours or up to 3 days. PREHEAT the oven to 400°F. Line the bottoms of two 12″ x 18″ sheet pans with parchment paper. REMOVE the logs from the refrigerator and unwrap them. Using a ruler and a sharp knife, cut each log into rounds ¼ inch thick. If the dough crumbles as you cut it, reshape each slice. PLACE the rounds on the prepared pans, spacing them 2 inches apart. Bake on the middle shelves of the oven, rotating the pans 180° halfway through the baking time, until the cookies are set but soft enough to hold a slight indentation when pressed with a fingertip (about 7 to 10 minutes). LET cool completely on the pans on wire racks. Store in an airtight container at room temperature for up to 1 week. Yield: 50-60 2-inch cookies. There are many other Christmas recipes you can find there too. Sift spices with flour and other dry ingredients. Add potatoes, carrots, raisins and mixed fruit, lemon extract, and butter. Mix well until batter is moistend through (this will take a few minutes). Put in buttered mold, fill about 2/3 full. Three 3″ fluted pans will hold the mixture. You can use a crockpot with steaming capabilities or put the molds in a larger baking dish, fill larger dish with boiling or very hot water, cover with foil and steam in the oven at about 300 degrees for 3 hours. Let sit 10 minutes before removing puddings from molds. Combine sugar, flour, salt, and vanilla/rum flavoring. Add enough cold water to make a thin paste. Cook over low heat until paste thickens up. Add butter or cream until desired thickness is reached. Will it Make you have a Merry Christmas? I hope all you Disney Mealer’s out there have a great Christmas! It’s a sad day, the last day of our Beauty and The Beast extravaganza. This week, all the food comes from Tale as Old as Time. In contrast to the messy porridge meal, the Beast learned manners in a Tale as Old as Time. I looked into some french soups and found Tourin, a french garlic soup. It was pretty good. Heat the butter in a large, heavy-based saucepan set over a medium heat. Sweat the onion with some salt for 6-7 minutes, stirring occasionally, until softened. Add the roughly chopped garlic cloves and the thyme and sweat for 3-4 minutes, stirring regularly making sure the garlic doesn't colour. Add 1.4ltrs of boiling water to the saucepan and bring to the boil. Reduce to a simmer for 15 minutes, then add the crème fraîche and whisk well. Remove the soup from the heat and discard the thyme sprig. Use a stick blender to purée the soup until smooth. Return to the heat and adjust to taste using the white wine vinegar and salt. Keep the heat over a low heat as you prepare the garlic garnish; heat the olive oil in a frying pan over a moderate heat. Fry the sliced garlic until golden brown, then remove to a plate lined with kitchen paper to drain. Ladle the soup into soup bowls and garnish with the fried garlic and some black pepper before serving. On the table, when the beast is eating soup, there sits a pile of artichokes. I never really liked artichoke, but this recipe was good. Place artichokes stem-side down in a bowl and drizzle with lemon juice. Slightly separate the artichoke leaves with your hands. Insert a knife blade into the center of each artichoke to create a garlic clove-size space. Drizzle each artichoke with olive oil. Press 1 clove of garlic into the center of each artichoke and season with salt. Tightly wrap each artichoke twice with heavy-duty aluminum foil. You can hardly see this, but it looks like there is a glass with a tiramisu in the back of the table. I’ve never made Tiramisu. but I had a good time making it. Separate the egg whites from the yolks and put them in 2 separate bowls. Mix the yolks with the sugar in one bowl. Stir in the Mascarpone cheese, one spoonful at a time, incorporating well. In the other bowl, beat the egg whites to form stiff peaks using an electric mixer. Then, add the beaten whites to the yolk-mascarpone mix, blending gently. The cream is ready. Set aside. Pour the rum extract and the milk into a small dish, then lightly dip the biscuits. Place them in the individual small serving bowls or cups (about 250 ml). Cover the biscuits with the cream. Sprinkle the cocoa powder (and sugar) on top. Refrigerate for at least one hour. Leave overnight in the refrigerator for best results. Serve cold. This is the centerpiece of today’s cook. Man, it was delicious. Take the butter out of the fridge to soften and preheat the oven to 350°F. Prepare the bundt pan by greasing it thoroughly with butter or baking spray. You can also flour it, if you want, although this isn't strictly necessary. Add the eggs and beat until fully incorporated and light. Beat in the flour, salt, baking powder, and finally the milk and vanilla. Beat everything together on low for 30 seconds, then high for 3 minutes. Immediately pour into the prepared pan and bake for 25 to 30 minutes, or until a toothpick comes out clean. Let cool on wire racks for at least 15 minutes, then flip each pan over onto the rack and tap gently all over. Lift the pan slightly. If the cake doesn't feel like it's falling out smoothly, lay a slightly damp kitchen towel over the pan and tap again. If necessary, let the cakes cool more. If they have been baked thoroughly, however, they should fall right out of the pans once they've cooled a little and the sides of the cake have shrunk back from the pan. Place the chocolate into a medium bowl. Heat the cream in a small sauce pan over medium heat. Bring just to a boil, watching very carefully because if it boils for a few seconds, it will boil out of the pot. When the cream has come to a boil, pour over the chopped chocolate, and whisk until smooth. Stir in the rum and molasses if desired. Allow the ganache to cool slightly before pouring over a cake. Last but not least, is the green jello salad on the table. Dissolve gelatin in 2 1/4 cup boiling water. Drain pineapple and add 1/4 cup of the pineapple liquid to the gelatin mixture. Pour into 9 x 13 glass casserole and refrigerate until soft set. Mix the softened cream cheese and milk together until combined. Add the nuts to cheese/milk mixture. Mix the jello mixture and cream cheese mixture together. Refrigerate overnight and cut into squares to serve. Will it be a meal as old as time? Sadly, the Tourin and the artichoke weren’t that great. But the Bundt cake might be one of the best we’ve made. The tiramisu was delicious too! Onto week three! This is the second half of one of my favorite songs in the Disney-verse, Be Our Guest. It’s basically a bunch of cakes! Since I posted the original be our guest video last week, here’s a horrible remake/remix from the Disney Channel original movie Descendants. This pink champagne acts as a diving pool for a bunch of utensils after a bunch of bottles blow their tops. Naturally, we’re not using real alcohol, but I found a simple recipe for faux pink champagne. I didn’t really like it, but my wife did. Man, Cogsworth just has a bad time. He’s constantly getting flung into food. I cheated on this one. I didn’t use a from-scratch recipe. I just followed the instructions on the back of a lime Jello box. Sorry everyone. We assumed that the 2 giant cakes at either side were just for show. But we made the other 5 cakes. The one on the left, we made a Versitile Vanilla Cake. Butter and flour two 8-by-2-inch cake pans, tapping out excess flour. In a medium bowl, whisk flour, baking powder, baking soda, and salt. In a large bowl, using an electric mixer, beat butter and sugar until light and fluffy. With mixer on low, beat in eggs and yolks, one at a time. Beat in vanilla. Alternately beat in flour mixture and buttermilk, beginning and ending with flour mixture; mix just until combined. Divide batter between pans; smooth tops. Bake until cakes pull away from sides of pans, 32 to 35 minutes. Let cool in pans 10 minutes. Run a knife around edges of pans and invert cakes onto a wire rack. Let cool completely. Place one cake, bottom side up, on a cake stand. Tuck strips of parchment paper underneath. Using an offset-spatula or table knife, spread top with Whipped Frosting. Top with remaining cake; frost top, then sides. For the cake second from the left and the full right, we made a French Chocolate cake. This is a legit french recipe. We even had to translate it. Preheat oven to 180 ° C (gas mark 6). Melt the chocolate in a saucepan with a little water. Off the heat, add the butter, flour and yeast. Prepare a foam with egg yolk , sugar and a little water; add it to the chocolate preparation. Beat the egg whites until soft peaks form and incorporate them into the pan gently. Pour into a mold greased with high edges, and bake for about 35 minutes. At the end of the song, a few more goodies dance past Belle. Notice that in this whole song, there were only a couple non-sugary dishes. Maybe the true intentions of the staff were to fatten Belle up so they could eat her! But I guess this isn’t a Brother’s Grimm Fairy Tale. Combine the sugar and water in a large pot. Boil until the sugar has dissolved completely. Stir in the strawberries and raspberries. Continue cooking for ten minutes. Strain through a tight strainer. Refrigerate the juice until chilled and toss the pulp. Once your juice has cooled stir in the cherry juice, lime juice, and orange concentrate (I added a bit extra orange concentrate). - pour mixture into an ice cream maker and follow instructions that came wit it. - pour into an air tight container. Freeze solid. Blend until smooth and freeze again. - pour into an air tight container and place into the freezer. Whisk every 20 minutes for the first two hours then freeze solid. Also we see some green frosted cupcakes. As the giant from Mickey and the Beanstalk would say, “smersmash, smishash, GREEEEEN FROSTING.” We made some green pistachio frosting. For the cake, we used the leftover from our Butter Pecan recipe. There is also ANOTHER cake. This time it seems to be a possibly strawberry cake. Preheat oven to 350 degrees F. Lightly grease 2 (9-inch) round cake pans. In a large bowl, combine cake mix and gelatin. Add pureed strawberries, eggs, oil, and water; beat at medium speed with an electric mixer until smooth. Pour into prepared pans, and bake for 20 minutes, or until a wooden pick inserted in the center comes out clean. Let cool in pans for 10 minutes. Remove from pans, and cool completely on wire racks. In a large bowl, beat butter and cream cheese at medium speed with an electric mixer until creamy. Beat in 1/4 cup of the strawberry puree and the strawberry extract. (The rest of the puree is leftover but can be used in smoothies or on ice cream for a delicious treat.) Gradually add confectioners' sugar, beating until smooth. Spread frosting in between layers and on top and sides of cake. Garnish with sliced fresh strawberries, if desired. Last but not least, to round out the song. There is the mousse inside a tarte dish. We ran out of time to put it in a pie dish, but the mousse is the main event anyway. Combine chopped strawberries and 1 tablespoon sugar in the bowl of a mini chopper or food processor, and toss gently. Pour 2 tablespoons water in a large bowl, and sprinkle with gelatin. Place 6 tablespoons sugar, the remaining 3 tablespoons water, and dash of salt in a small heavy saucepan over medium-high heat; bring to a boil, stirring just until sugar dissolves. Cook, without stirring, until a candy thermometer registers 240° (about 4 minutes). Add egg whites to gelatin mixture; beat with a mixer at high speed until foamy. Place cream in a large bowl; beat with a mixer at high speed until stiff peaks form. Gently fold one-fourth of egg white mixture into whipped cream. Fold in the remaining egg white mixture. Spoon about 1/2 cup mousse into each of 6 dessert glasses; chill 2 hours or until set. Will it make you Our Guest? All the food, minus the faux champagne, was delightful. My favorite was actually the strawberry cake. It was so fruity, sweet and moist. Yay! Onto week two of Beauty and the Beast! This week will cover the first half of the Be Our Guest song. There is SO much delectable food this week, including the long awaited GREY STUFF!!!!! (Yes, before you go and ask the dishes, I’ll tell you that it is delicious). So relax, pull up a chair as DisneyMeals proudly presents, Beauty and the Beast pt 2. So before the song even starts, when Cogsworth is fighting against feeding Belle, he gets knocked into a custard-like substance. That brings us to our first recipe. Homemade Custard! Combine milk and vanilla in a saucepan. Heat until it starts to softly boil. While the milk is heating, beat the eggs and sugar in a medium bowl until the mixture is a pale yellow. Add the flour and stir. Add the boiling milk and mix well. Pour the mixture into the pot and cool over a low heat, stirring occasionally, until mixture thickens. Now onto the song. The first food sung about is Soup du Jour, which actually means Soup of the Day. That means I got to pick any frenchy soup I wanted. I made a really really good Creamy French Potato Soup! 1 Saute potatoes, onion and parslay in oil. Cover and cook on medium heat for 15 to 20 minutes, until pototpes are tender and translucent. 2 Add stock, bay leaf and seasonings. Mix together cream and flour. Add to potatoes. Simmer 30 minutes. Remove bay leaf. To serve:heat and garnish with chives. The next couple of recipes are all on one plate. So I won’t provide separate pictures for the each recipe. Ok ok, we’re always asked if we have made the grey stuff. It is one of the most requested recipes on this blog. We finally have it for you. We took from what Be Our Guest restaurant makes in Disney World. I figure their recipe should be close, as they are official. So without further ado, here is the recipe for the Grey Stuff! While chilling, place Oreos into a food processor or blender and blend until they are a dust. Add the chocolate pudding mixture and stir. Chill in refrigerator for 1+ hours. Stir in sugar, salt, eggs, butter, and 1 cups of flour. Beat until smooth. Mix in remaining flour until smooth. Scrape dough from side of bowl. Knead dough, then cover it and let rise in a warm place until double (about 1 1/2 hours). Roll into a 12-inch circle. Cut into 10 to 15 wedge. Roll up the wedges starting with the wide end. Place rolls with point under on a greased baking sheet. Cover and let rise until double (about 1 hour). Bake at 400 degrees F (205 degrees C) for 12-15 minute or until golden brown. Brush tops with butter when they come out of the oven. The hors d’oeurve with the olive is probably something from the artist’s imagination. I decided to interpret it as a creamy pesto spread! Place all ingredients into a bowl and mix until uniformly mixed. On the left side of the plate, there is a cracker with a pink blob on it. Some Disney Meals fans helped me sleuth that it was probably a salmon pate. Grill the salmon fillet, topped with fresh parsley and salt and pepper. There are some Hors d’oeurves that don’t really have recipes. Some dishes begin to dance in front of Belle. The first is Beef Ragout. Beef Ragout, I found out, is a French beef stew. Combine meat and flour in a large plastic food storage bag and toss to coat evenly. In a 6 quart saucepan brown meat in hot vegetable oil. Season with salt and pepper, if desired. Add diced tomatoes, beef broth, carrots, potatoes and thyme. Bring to boil; reduce heat to medium-low, cover; and simmer for 1 hour or until beef is tender. Blend in mustard and serve. The next dancing dish is a Cheese Souffle. I was SUUUUPER nervous about making this. I had never made a souffle before and I had always heard how hard it is. And….well it is hard. I messed up and accidentally put in too many eggs. But surprisingly, it turned out great. Position rack in lower third of oven and preheat to 400 degrees. Butter 6-cup (1-1/2 quart) souffle dish. Add Parmesan cheese and tilt dish, coating bottom and sides. Meanwhile, melt butter in heavy large saucepan over medium heat. Add flour and whisk until mixture begins to foam and loses raw taste, about 3 minutes; do not allow mixture to brown). Remove saucepan from heat; let stand 1 minute. Pour in warm milk, whisking constantly until very thick, 2 to 3 minutes. Remove from heat; whisk in paprika, salt, and nutmeg. Scrape souffle base into large bowl. Cool to lukewarm. DO AHEAD; can be made 2 hours ahead. Cover and let stand at room temperature. Fold 1/4 of whites into lukewarm or room temperature souffle base to lighten. Fold in remaining whites in 2 additions while gradually sprinkling in Gruyere cheese. Bake until souffle is puffed and golden brown on top and center moves only slightly when dish is shaken gently, about 25 minutes (do not open oven door during first 20 minutes). She picks the cherry off a pie. We just made a mini pie for this. Place the berries into the prepared pie tin. Cut slits in top of pie for ventilation. So it is a little bit unclear of what is en flambe. I took to assume that pie and pudding are joint and en flambe, even though Lumiere only flambes the pie. Combine 1 cup berries with 3/4 cup sugar in pan. Simmer on low heat until sugar is melted and mixture is very liquid; about 5 minutes. Combine cornstarch and water in bowl. Add to pan with blueberries. Cook over medium heat until mixture comes to full boil and is clear and thick. Pour hot mixture into large bowl.Cool until warm. Fold in remaining 3 cups of blueberries, lemon rind, lemon juice, cream of tartar, cinnamon, nutmeg and butter. Prepare the pie dough as directed. In a box-shaped dish (we used a 9x7 bread pan), line with pie dough. Add the filling to the dish. Add top crust and brush with egg wash, sprinkle with sugar. Preheat oven to 400°F but reduce heat to 375°F when you put pie in oven. Bake about 40 minutes. Check pie halfway through baking; cover edges with a strip of foil if edges are getting too brown. In a heatproof container, pour 4 tbs rum. With a long match, immediately light rum on fire. Let burn for a bit and then pour onto the pudding. We made a video of flambe-ing the pie and pudding. Place the chocolate and butter in a heatproof bowl and place over a saucepan containing barely simmering water (or use a double boiler). Melt the chocolate and butter together and stir with a wooden spoon until smooth. Add the egg yolks to the chocolate, 1 by 1, beating with a whisk until incorporated. In another bowl, beat the egg whites until foamy. Add the cream of tartar and continue to beat. Gradually whisk in 1/4 cup sugar and continue beating until stiff peaks form. Beat heavy cream in a chilled bowl until it begins to foam and thicken up. Add the remaining 2 tablespoons sugar and vanilla. Continue to whip the cream until it holds soft peaks. Gradually and gently fold the egg whites into the chocolate mixture to lighten it. Then, delicately fold in the whipped cream. Take care not over work the mousse. Divide mousse into 4 individual glasses. Cover and chill for several hours. In a heatproof container, pour 2 tbs rum. Will it be a Dinner that’s Never Second Best? Oh man, this was amazing. The grey stuff really was the best. Everyone that tried it raved about it. There really wasn’t a bad food out of all of this. Bonjour! So this week is Beauty and the Beast. Lucky for you and us, there are TONS of foods shown in this movie. So instead of just one week dedicated to the movie, you get FOUR! This week covers from the start until Be Our Guest. Be Our Guest itself will be divided into two weeks and then we’ll do one of Be Our Guest and onward. So now we invite you to relax, let us pull up a chair as Disney Meals proudly presents – Beauty and the Beast! Grease and flour three 7x3 inch loaf pans or 1 9x4 inch pan and then 6 cup cakes. In a large bowl, mix together pumpkin puree, eggs, rum, lemon juice, oil, water and sugar until well blended. In a separate bowl, whisk together the flour, baking soda, salt, cinnamon, nutmeg, cloves and ginger. Stir the dry ingredients into the pumpkin mixture until just blended. Pour into the prepared pans. Bake for about 50 minutes in the preheated oven. Loaves are done when toothpick inserted in center comes out clean. The baker also has rolls. Sift the flour and salt in a bowl and then set aside. Mix 1/4 cup of water with yeast and stir until it has dissolved. Mix in the sugar and let stand for about 10 to 15 minutes. Make a well in the flour and pour the yeast mixture in. Add the milk and 1/4 cup water and mix together. Add the rest of the water slowly until dough is soft and moist. Knead for about 8 to 10 minutes. Place in oiled bowl and cover it with a damp towel. Let rise for about 2 hours. Place dough on floured surface and punch down. Cover it again and then let it rest for about 5 minutes. Divide it into 10 pieces. Roll each piece into oval shape and then place on a baking sheet. Cover with damp towel and let rise for about 30 minutes. Slice a slit down the center (vertically) on each roll. Cover and let rest for 15 minutes. While rolls are at rest, place a dish that is oven proof and with about 1 1/3 inch of water in it in the lower part of the oven and heat it to 450 degrees Fahrenheit. Bake the rolls for about 15 minutes and then let cool down. Serve. Now, the movie doesn’t actually show the baguettes, but I love the line the baker says. “That’s nice. MARIE, the baguettes! Hurry up!” So we made some baguettes. They were similar to the rolls, but I think this recipe is better. Place dough in a greased bowl, turning to coat all sides. Cover, and let rise in a warm place for about 30 minutes, or until doubled in bulk. Dough is ready if indentation remains when touched. On a lightly floured surface, roll into a 16x12 inch rectangle. Cut dough in half, creating two 8x12 inch rectangles. Roll up each half of dough tightly, beginning at 12 inch side, pounding out any air bubbles as you go. Roll gently back and forth to taper end. It might help to have damp hands. Place 3 inches apart on a greased cookie sheet. Make deep diagonal slashes across loaves every 2 inches, or make one lengthwise slash on each loaf. Cover, and let rise in a warm place for 30 to 40 minutes, or until doubled in bulk. Mix egg yolk with 1 tablespoon water; brush over tops of loaves. In the song we also see the baker walking around with a pink cake. I decided to make some French Yogurt cake and frost it with pink cream cheese frosting. Even though I accidentally overcooked it a bit, it turned out really well and tasty. Coat a 9" circular cake pan with nonstick vegetable oil spray. Dust with flour; tap out excess. Whisk 1 1/2 cups all-purpose flour, 2 teaspoons baking powder, and 3/4 teaspoon kosher salt in a medium bowl. Using your fingers, rub 1 cup sugar with 1 tablespoon finely grated lemon zest in a large bowl until sugar is moist. Add 3/4 cup whole-milk Greek yogurt, 1/2 cup vegetable oil, 2 large eggs, and 1/2 teaspoon vanilla extract; whisk to blend. Fold in dry ingredients just to blend. Pour batter into prepared pan; smooth top. Bake until top of cake is golden brown and a tester inserted into center comes out clean, 20-25 minutes. Can be made 3 days ahead. Store airtight at room temperature. Makes 1 layer of cake. For a 2 layer cake, double recipe. As it is normal for Disney movies, there is lots of alcohol. So when Gaston is in the tavern, and everyone is singing about how great he is, there is a lot of beer shown. So we decided to make some ginger beer! It turned out well! Grate enough ginger using fine grater to measure 3 1/2 tablespoons, then put in a fine-mesh sieve set over a bowl to collect juice, pressing on solids and then discarding. I also found that putting the ginger in a coffee filter or a teabag and let it steep in 1 cup of hot water for 15 minutes does the job too. Place funnel in neck of bottle and pour in 3 tablespoons ginger juice (reserve any remaining for another use). Add sugar, lemon juice, yeast, and a pinch of salt. Fill bottle with water, leaving about 1 1/2 inches of space at top. Remove funnel and screw cap on tightly. Gently shake bottle to dissolve sugar. Let stand at room temperature until plastic feels hard and no longer indents when squeezed, 24 to 36 hours. Chill ginger beer until very cold. Ginger beer keeps, chilled, 1 week. Now for the fun part. Gaston eats 5 dozen eggs now that he is grown. I had never eaten raw eggs plain. So I ate some rocky style. It actually wasn’t that bad. Back to the Bonjour song, A sheep eats a corner of Belle’s book. So I ate some paper for good measure. There is also a wedding cake shown for Gaston’s failed proposal. You can refer to Lady and the Tramp for a good Wedding Cake recipe. There is also some wine shown in the tavern. You can check out Fantasia for that. Will it Make you the Size of a Barge? So everything was really good. The baguette was better than the french rolls. The pumpkin bread is delicious especially with a little butter on it. The cake, although overcooked was really really good and would probably be even better if it were cooked right, and the ginger beer wasn’t all that bad! Fire up some Billy Joel and get ready for some NYC action. I actually really like Oliver and Company, even though it is one of Disney’s lowest rated films. It also has really great food, especially if you’re a cat or dog! see Stromboli’s French Bread from Pinocchio. Dodger is one sly dog. He tricks Oliver distract the hot dog cart guy and in turn steals the yummy hot dogs. To make this more authentic, I recommend using Sabrett Hot Dogs. If you can’t come by those, at least use all beef franks. After it has reached boiling point, put the dogs in the pot and take it off the heat. If you have a steamer, you may use that to steam the buns. If you have a cat, you’ll love this recipe. When Jenny first gets Oliver, she brings him back to her giant house and makes a who-know-what concoction to give to him. You see some sort of cereal or bran, eggs, and a bunch of messy dishes. Fortunately, when I made it, I didn’t make as big of mess as she did. Mix oats and evaporated in bowl. I know, I know, chocolate is really bad for dogs. But we see Georgette eating chocolates from a heart-shaped box and doing yoga. Stir vigorously with wooden spoon. Squeeze a little dab of peanut butter on top of the carob in each mold. About the size of a big pea. Place in freezer for about an hour or until the carob solidifies. You may also place in fridge, but wait longer for the solidification. You might need to hold the pan off the stove a bit if it gets too hot and you start to smell it burn. For milk chocolate, melt the milk chocolate in a microwave on a low heat, stirring every 30 seconds, or melt in a double boiler. Follow the rest of the instructions. You may place anything you wish in the middle of the chocolates. I put in Nutella and raspberry jam. At the end of the movie, everything is good and every is around Jenny as they celebrate her birthday. Being super rich, she probably had a fancy cake (even though you only see a generic pink cake). How do you make a fancy cake? With champagne of course! This is a somewhat difficult and time consuming recipe. Just a head’s up. There is also chocolate, strawberry and vanilla ice cream shown in the movie. This cake pair well with Neapolitan ice cream! So pick some of that up from the store. In a medium heavy saucepan over medium-high heat, bring champagne to a boil. Boil until reduced to ½ cup, about 15 minutes. Remove from heat; set aside to cool completely. Meanwhile, arrange oven rack in lower third of oven and preheat oven to 350ºF. Grease three 8-inch round with shortening or oil. Line bottoms with parchment or wax paper cut to fit the size of pans. Grease paper linings and dust lined pans with flour, tapping out the excess. Mix self-rising flour and sugar until well combined and aerated. Add butter, shortening and oil and mix until thoroughly combined. Mixture will be very thick. In a 2-cup glass liquid measuring cup, whisk together champagne reduction, buttermilk, egg whites and extracts using a fork until well blended. Slowly add half of the liquid mixture to the batter and mix. Then beat until thoroughly combined, scraping down the sides of bowl as necessary with rubber spatula, about 2 minutes. Add remaining liquid mixture and beat just until smooth and thoroughly combined, again scraping down the sides of bowl as necessary. Using rubber spatula, scrape and pour batter into prepared pans dividing evenly (a little over 2 cups of batter per cake pan). Smooth tops evenly with rubber spatula and then rap each pan on counter surface 2 to 3 times to expel any air bubbles. This step will create a nice level cake. Bake in preheated oven until a toothpick inserted into center comes out clean, about 25 to 30 minutes. Cool cakes in pans on wire racks for 10 minutes. Run thin metal spatula around edges of each cake to loosen, then invert onto wire rack and peel away parchment or wax paper. Turn right side up onto wire racks (using an additional rack to flip) and cool completely or wrap while still warm to retain moisture. Wrap each cake layer tightly in plastic food wrap and keep at room temperature until ready to fill and frost. Mix a couple drops of food coloring into the frosting to turn it into a nice pink color. Use a scant ¾ cup frosting between each layer. After frosting each the bottom and middle layer, pipe a simple ¼-inch border of buttercream around the perimeter of the cake to act as a dam to prevent the filling from going over the edge of the cake layer. Following this, lightly spoon about 4 tablespoons of the Raspberry Filling on top of the buttercream in the center. Using a small angled metal spatula, carefully spread the filling outward to the dam border of buttercream. Carefully place the next cake layer on top and press down gently. Proceed to frost the cake as desired with remaining buttercream. Use a scant ¾ cup frosting between each layer and then proceed to frost the cake with a “crumb coat” or thin coat, but not too thin. The cake should have good coverage and you should not see the cake peeking through the frosting. Next, assemble your pastry bag with coupler and tip. Fill pastry bag and twist closed. Make sure your hands are not too warm or your buttercream will get too soft. You are now ready to pipe roses! hen pipe in a circular fashion counter-clockwise going around the center point once or twice depending on the size of roses you desire. The roses don’t need to be perfect! This is what is so great about piping swirled roses as they look lovely shabby and chic. It is best to end in the same place each time and I like to end at the top right side of each rose. Once you complete the first row around the cake, continue with the next row and then the top. To fill in any gaps, I like to pipe small stars or flourishes that contour the rose swirls. Rose Cakes are the best. So simple, but so stunning! Will it make you get the Street Saviore Faire? Overall, this was a really good haul. Hot Dogs were great, the cake was one of the best cakes I’ve ever had, and if you were a cat, I’m sure you’d love the concoction. The dog chocolates were pretty disgusting for humans. I don’t really like carob. But my dog loved them. But the milk chocolate candies were amazing. Disney’s take on Sherlock Holmes may not Bendaduck Cumberbottom worthy, but it’s still great. We have the classic British tea and crumpets shown as well as some beer (which isn’t uncommon in Disney). However, I decided to skip eating a mouse like Ratigan’s cat does. Crumpets are usually pan fried and not baked. However Mrs. Judson makes cheese crumpets that resemble muffins. They also show lots of tea. I don’t drink tea, but if you want to make proper English tea, check out this site. When I made the crumpets, I actually missed the fact that they were cheese crumpets. But I’m sure if you add a cup of grated cheddar, it’d turn out great. However, even without the cheese, they were great. Soak yeast and first amount of sugar in warm water until frothy (15 minutes). Add butter, second amount of sugar, salt and orange rind to warm milk and stir. Add this to the yeast water. Beat, then add the eggs and flour. Add cheese if desired. Beat until batter is smooth. Preheat over to 400 °F. Fill the greased pans about 2/3 full and bake for 15 minutes or longer, until done. All of Ratigan’s supporters drink beer. They even try to poison Basil and Dawson’s beers. Of course, we’re keeping this a kid friendly blog, so we decided to make Root Beer! BUUUUUUUUUT, we hit a snag. First, I didn’t realize how hard it was to get dry ice where I live. Then I found a recipe to make Root Beer with yeast. So I went and got yeast and I was going to get root beer extract, but I couldn’t find any root beer extract! I didn’t have enough time to go somewhere else, so I wasn’t able to make the root beer. I’m sorry if I let you guys down. But here’s a recipe. Clean and sanitize all bottling equipment according to information below. Shake Root Beer Concentrate well. Mix with sugar in a large container. (DO NOT USE ALUMINUM). Stir in spring water. Dissolve yeast in 1 cup pre-boiled water. Allow yeast to dissolve undisturbed 10 to 15 minutes. Add to sugar mixture and stir well. Bottle immediately into plastic bottles, leaving 2-inch space at top of bottle. Cap tightly. Store each bottle on its side in a warm place (70° to 80°F) for 1 to 2 days, then store upright in refrigerator at 40° to 45°F for additional 3 to 4 days. Keep refrigerated and consume within 7 to 8 days. Is it Elementary my Dear Dawson? So the crumpets were really good. I’d definitely have them again. English know how to make food. I swear I didn’t cry when the widow drove Tod out to leave him in the forest. I was cutting onions…cuz this is a food blog. No crying here, just onions. Man, this movie is good, and so sad. It could be because dogs and foxes are so cute. There wasn’t too much food in the movie, but the highlight was the widow’s raspberry jam! There are a few times where fresh milk is shown. There really isn’t a recipe besides buying a cow, and milking it. But we wanted to experience what Tod experienced. Selling raw milk is illegal here, except if the milk is sold directly from the farm. So we drove 1.5 hrs outside the city to a dairy farm and got a gallon. Man, it was delicious. So rich and creamy. Some people even claim it’s better for you. So if you’re in an area where you can get some fresh milk, I highly recommend it. When Tod is getting chased by Amos Slade, we see the widow cooking something on the stove. We’re not sure exactly what it is, other than it is some red substance in a pot. I figure, why not make some raspberry jam. It makes sense that the widow would be making something like that. I had no idea that making raspberry jam was so easy! It turned out delicious. Pour in jars and refrigerate. In the saddest part of the movie…that I definitely didn’t cry in…the widow is driving Tod away. She looks at a photo of him on his birthday with a big ol’ cake. We have experience making treats for dogs from the 101 Dalmations post, so we decided to make a doggie cake because foxes and dogs are pretty similar, right? Our dog loved the cake. Combine the egg, peanut butter, oil, vanilla, and honey, if desired, in a large bowl; blend well. Stir in the carrots and bacon, mix thoroughly. Sift together the flour and baking soda and fold into the mixture. Spoon cake batter into prepared pan. Let cake cool in pan for 10 minutes; then turn out onto a wire rack to cool completely. Beat with electric beater until smooth. Will it Make us Best of Friends? The milk was amazing. The raspberry jam might be one of my favorite recipes. We tried it on crepes that day too and it was divine. Our dog loved the foxy cake (and it wasn’t HORRIBLE for human consumption). Now go watch Fox and the Hound. It’s on Netflix. 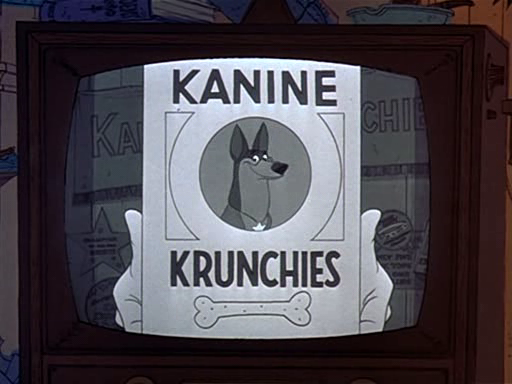 Get your puppies together and check out some dog-centric recipes from 101 Dalmatians.